When we talk about Bank PO or Software jobs, both are perfectly good profiles. But one has to figure out which job suits best. Both the Bank and Software jobs involve hard work. These jobs not only depend on your aptitude but also your attitude towards the job. Banks jobs will definitely provide you with a wider range as you don’t just sit on your PC and work on your project but you also get to work with different clients and learn to handle a different level of issues every new day. Remember before analyzing for a job, to analyze yourself and your interests. One should make sure they suit in that place which will help to perform better. Here we have compiled some experiences of people who have worked in both sectors. We have provided a simple infographic table below for easy and better understanding. This will help you choose wisely between the two options. 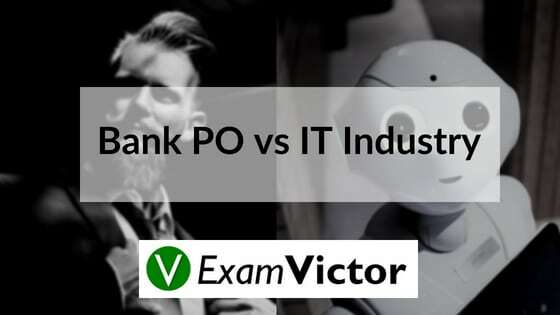 In this blog post, we have provided you the factors to be considered by the applicant while choosing between Bank PO and IT Industry. We have talked about the main factors like Job Security, Salary, Perks, Growth Prospectus and more. ExamVictor has created an amazing and comprehensive course which addresses the entire requirements of IBPS PO exam and SBI PO Exam. If you like this post and want to know more about our course, then please click on the link given below. Hope you liked this post. Share your views in the comment section below.